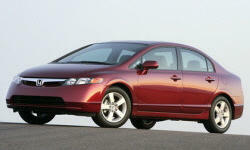 Honda Civic Rear Seat Room & Comfort Pros and Cons | Page 1 of 1 | Why Not This Car? The front seats are comfortable and supportive in both cars, with Hyundai's likely agreeable for a wider range of body sizes and types. Rear seat was a bit tight for adults, in hindsight we should have bought the Accord. I just flat didn't fit in the back seat, so I never sat here while the car was moving. The Civic has one of the roomiest rear seats in the segment. Any adult center passenger will appreciate that the floor is nearly flat. The Jetta has even more rear legroom, though. Not comfortable for tall people in the rear seat. not able to fit a rear facing child seat, or very difficult to fit it. we had to even find a small size one. Small rear seat compared to the Prius. back seat? maybe for a child on a short trip. No access from trunk area. Also, very strong chemical smell in vehicle...off gassing from fabrics. The prius did not have near the smell. It has three seat belts but only two people fit back there comfortably. Less leg room than Prius.